Access to safe drinking water is essential to human life. Dr. Susana Kimura-Hara, PhD, assistant professor in the Faculty of Science, has an interest in keeping our drinking water safe. She is doing that by researching how compounds derived from human activities (i.e., industrial and municipal wastewaters) may be removed or transformed by water treatment processes. With her research group, Kimura-Hara is developing methodologies that can assess the chemical formation and composition of disinfected waters and overall water toxicity. 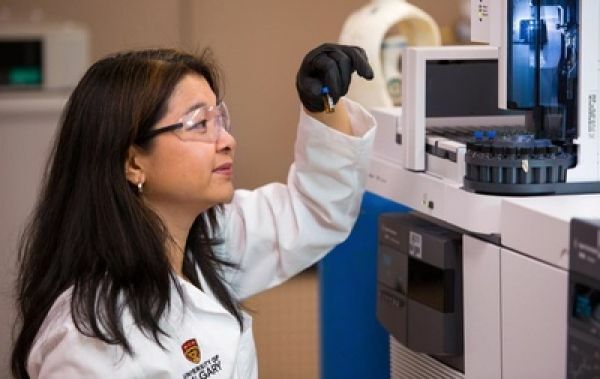 She is hoping to use this information to optimize engineering processes, develop new water treatment, and provide policy-makers the knowledge base needed to create guidelines for the safe use of wastewater-impacted waters today and build toward Canada’s water sustainability. Continue reading at University of Calgary. Image via University of Calgary.